I'm back from the Rhode Island Regional Event. What an amazing time! I came home so inspired! 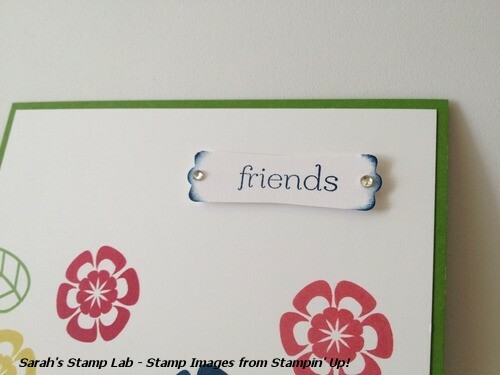 It's definitely one of the best perks of being a Stampin' Up! demonstrator! I did quite a bit of swapping while I was out at the Regional. Today I'm going to show you the first swap I made. This is a really easy CAS (Clean And Simple) card to make. I love that it features all five of our new In Colors. For a little extra glitz I added the Basic Rhinestones! Here's a close up of the sentiment tag. I sponged the ends of it with Midnight Muse and popped it up on dimensionals to make it stand out on the white background. If you are swapping a card like this (whether with your stamping friends or at an event) the best way to go about it is to stamp all the images of one color first. Also stamp the lightest color first. 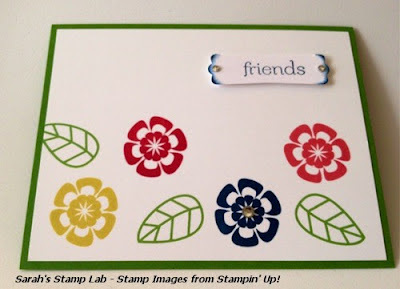 So I went about making these cards by stamping all of the Summer Starfruit flowers first, followed by the Primrose Petals, Raspberry Ripple, etc. Wouldn't this make a great birthday or get well soon card as well? How would you take it to the next level?